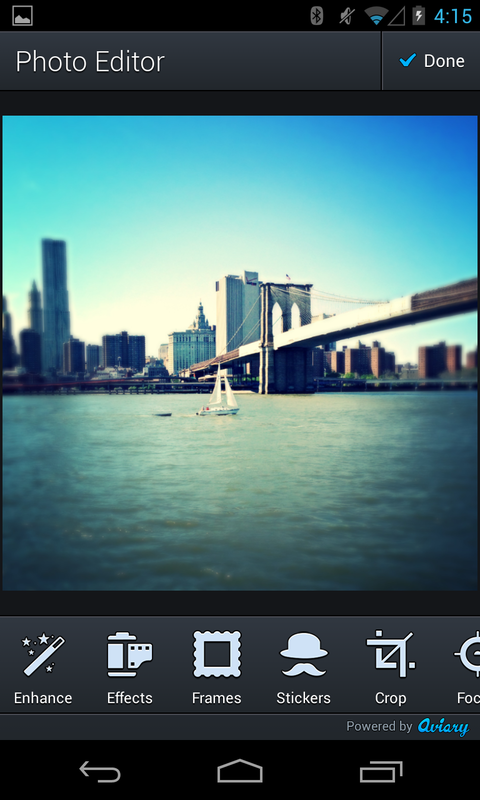 Today we're introducing Version 3.0 of Photo Editor by Aviary for Android. This is a gigantic update - our biggest for Android, ever! It features a beautifully redesigned interface that’s faster, easier to use, and a lot of fun. Sleek, Streamlined Interface – First and foremost, the user interface has been completely redesigned, and it's beautiful. The main editor toolbar now scrolls instead of paging, making it way easier to find all of the Editor's great tools. We've also gone to great lengths to highlight the most important part of the Editor - your photos - by switching over to a dark theme and reducing padding. Improved Enhance Tool – Enhance, has been…enhanced! This incredibly popular tool now has three great settings: Hi-Def, Illuminate, and Color Fix. Hi-Def smartly sharpens, adjusts contrast, and brings out the best parts of your photo, while Illuminate makes poor-lit photos look like they were taken in great lighting. Color Fix (previously called Balance) does intelligent color correction and works beautifully. Beautiful Filters – One of the awesome things about our Android Showcase App is that you can customize your version of the app by installing content packs. You can add incredible Filter packs for even greater flexibility and additional editing options. With today's new Android release, we're introducing the Woodland Effects Pack, perfect for outdoor photos. This pack has been a big hit on iOS, and we think our Android users are also going to love using it this summer. Super Fun Stickers – Users love taking advantage of our stickers to add fun, creativity, and surrealism to their photos. Like Filters, users can install new sticker packs through our in-app store. Packs like Space, Mustaches, and Hats have been incredibly popular, and we’re adding new stickers all the time. Color Splash – Our awesome ‘Splash’ tool strips out color from your photo, then lets you paint it back in a super fun way. The Smart Color brush intelligently limits splash to the color of your choice, while the Free Color brush lets you just go nuts and color in whatever you want. It’s one of our favorite tools, so check it out. Reduced Bundle Size – We've reduced the file size of the editor by over 10%, which means it's quicker to download and takes up less, precious space on your device. And there are all sorts of other little tweaks and improvements going on underneath the hood, which makes for a faster, more stable, and all around better app. So check it out and get editing some photos! Want to show off your work or let us know what you think? Hit us up on Twitter to get in touch. Happy editing! iOS users: we didn’t leave you out! A brand new version of Photo Editor is also available for iPhone, iPad, and iPad Touch in the App Store. Today we're announcing version 2.4 of our Showcase App for Android, which introduces a brand new tool and improves a few existing favorites. Go ahead and grab it from the Google Play Store to check it out. The first thing you'll notice about 2.4 is the new Focus tool. This has been one of our most requested features for a while now so we're excited to finally be able to offer it in our Showcase App. Focus is our take on a tilt shift tool, which selectively adds a circular or rectangular blur to any photo. This is perfect for drawing attention to a particular part of a photo or going for the classic tilt shift effect that turns photos into miniature-looking scenes. Tried the tool and have some feedback? Let us know. We use this Showcase App as a vehicle for testing out new features before releasing them to the thousands of developers who use our photo editing SDK, so your feedback is incredibly valuable. We also updated the incredibly popular Splash tool to make it way easier to use. It's now even better at selectively adding color back into any photo. Lastly, we've reworked the Effects tool under the hood to be faster. We've got a lot of great new effects coming soon, so be on the lookout. Just click the 'Get More' button inside the Effects tool to see whats available. Have you tried 2.4 yet? The brand new Focus tool? Hit us up on Twitter to show off your work! Today we're introducing a new feature in the latest version of our Android Showcase app: color splash. We're incredibly excited about this, and once you take it for a spin, we think you will be too. Our Splash tool allows you to strip all color from any photo, then magically add it back to any part of the image. It comes with two brush choices: Smart and Free. The Smart brush intelligently looks at the color you want to add back in, and only fills in parts of the image that are similar in color. The Free brush, on the other hand, is a total free-for-all and perfect if you just want to go nuts. It lets you re-color any part of the photo regardless of the hue. Also, don't worry about messing up: if you make a mistake with either brush, you can always undo it with the built-in eraser. Also in this version of the Android Showcase: new stickers! Our Space sticker pack was such a hit that we've added more of 'em in a new pack we're calling Galaxy. This one has nebulae, bursts, stars, crazy-looking lines, and other fun space stuff. Check it out. Have you tried out Splash yet? Make some really cool images with it? If so, use the #aviary hashtag to share them with us on Twitter. In the spirit of keeping things moving in 2013, we have yet another Android announcement: version 2.2.1 of our Android SDK has been released. This is a massive update, and if you're an Android developer thats using Aviary's SDK to bring beautiful photo editing functionality to your users, you want to get your hands on this. Let us fill you in on what we've added. To start, we've completely reworked the Effects tool. We found that users didn't care about effects categories, they just wanted to get right into the actual effects and start adding them to their photos. So we removed the effects canister screen, completely eliminating a step from the process. We also redesigned the 12 default effects that come with the tool to be more subtle and just generally way more usable. We tested this change in our Showcase app back in December and saw a massive spike in usage, so we're confident your users are going to love this. Make sure you check out the Avenue, Cruz, and Clyde effects - our users have really been digging these. We've also added a brand new Frames tool. Users were tired of being forced to use certain frames with certain effects, so we pulled the two apart and gave Frames its own tool. To start, the tool features 12 beautiful frames, and we'll be adding more all the time. 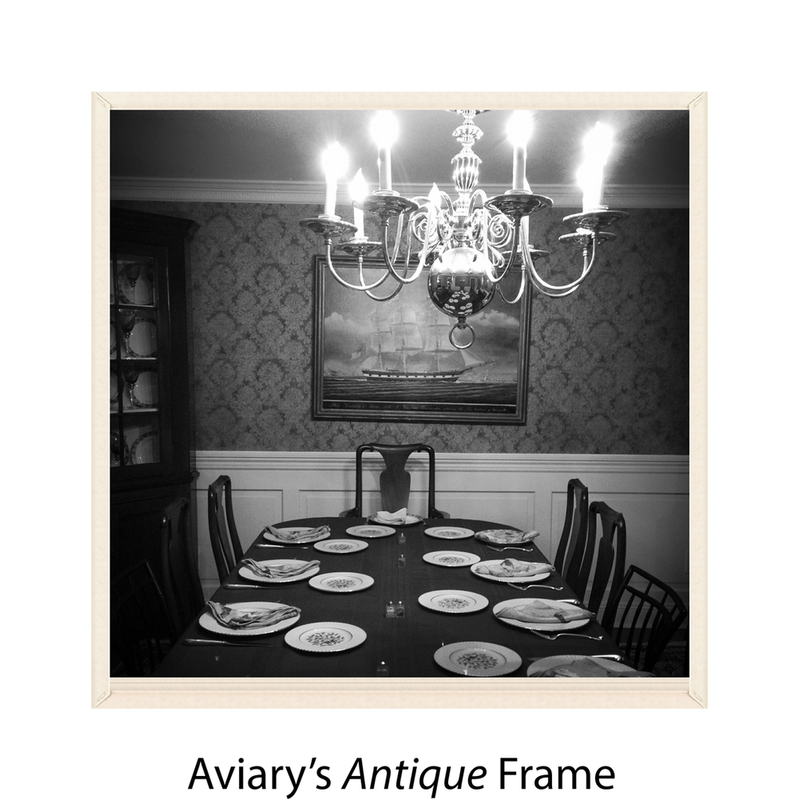 So far, the Antique, Splatter, and Grit frames have all been the most popular in our Showcase app. Lastly, we've taken care of some necessary business with this release, cleaning up an Orientation tool bug, adding support for x86, and changing the way you need to pass your API-KEY to the SDK (definitely consult README.MD for more info on this one). Have you implemented version 2.2.1 into your own app? What do you think of the new effects and frames? Let us know in the comments below. 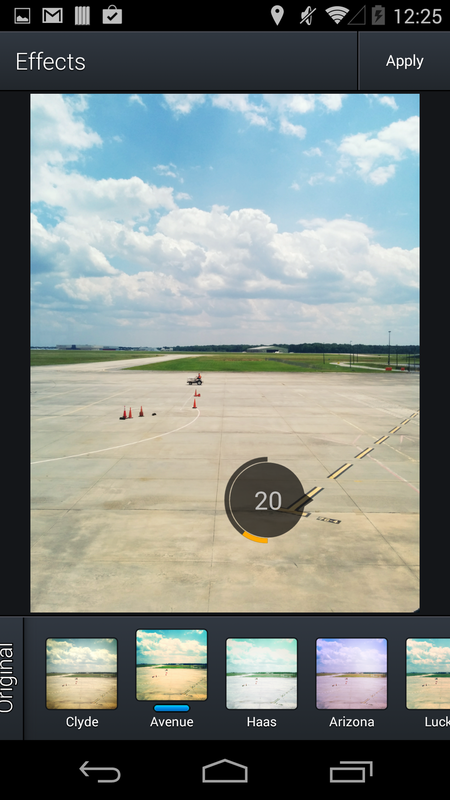 Good news: we just pushed out a brand new version of Photo Editor by Aviary for Android. It's our first release of 2013, and you can grab it now from Google Play for free. This new release updates a few of our favorite features, and addresses a number of annoying bugs. The Meme Tool, Text Tool, and Orientation Tool have all been updated to resolve some minor issues. Meanwhile, the Output Folder Setting (this is what allows users to choose where we save their photos) now operates as advertised again (ahem!). We think of the Aviary-branded apps, both for iOS and Android, as our "Showcase Apps" - because they showcase all the great things our developer partners can offer their users when they work with Aviary. This includes our beautiful effects, one-click photo enhance, super-fun stickers, crop, draw, and more - you name it, we’ve probably got a tool for it. Releasing new versions of our Aviary Showcase Apps means we get to test drive updates to these awesome tools and any new features with millions of photo-obsessed users. This allows us to gather real-life user feedback, prove (or disprove) some of our hypothesis and, occasionally, iron out any wrinkles before delivering technology to our developer partners via our SDK. If you’ve checked out Photo Editor and would like to give us some feedback, please let us know in the comments below. We’d love to know what you think! Since we released our mobile SDKs (currently available for iOS, Android, and Windows Phone 7), we've received overwhelmingly positive feedback from partners and users alike: everyone loves the convenience of being able to use Aviary within their favorite mobile apps! That said, we still heard from a lot of people who wished they could occasionally use it as a standalone photo editing app on their phone. Aviary's focus is on supporting developers, and the photo editor we're releasing today is intended to be a quick and easy way for developers to evaluate our product before integrating it into their own app, while giving us a way to quickly test new tools and features before releasing them in our SDK. 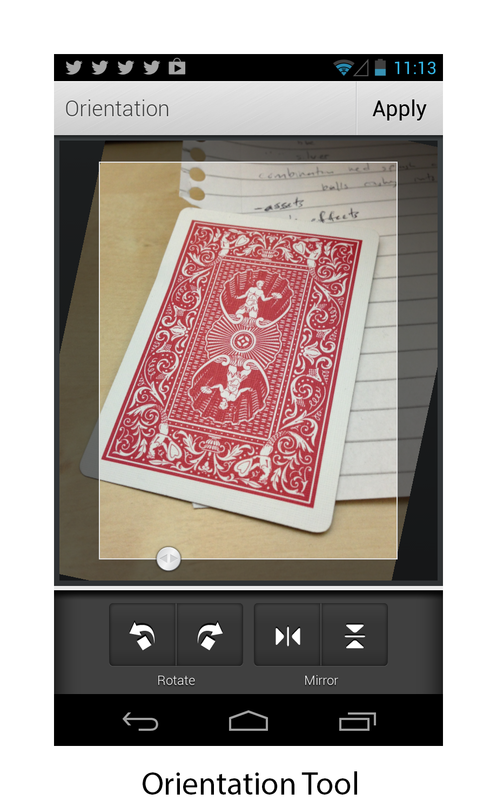 As it turns out, it's also a great photo editor that we think consumers will really enjoy. *Note: If you're already using our Android plugin, there's no need to install the new app. Just update Aviary on your device and you'll have all the new features! You'll still be able to share to Aviary from other apps, but now you can launch it as a standalone app as well. Adjust settings to customize and rearrange the order of the tools in the editor. If you're a developer, this will help you get a sense for how easy it is to customize our tool list in your app. Or if you just love Aviary's text tool and use it all the time, you can move it to the first page of the editor so you can get to it with just one tap. 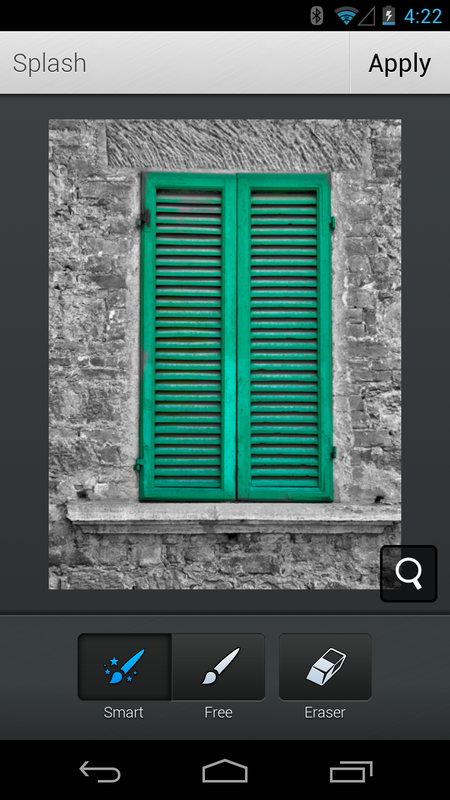 You can install Aviary from the App Storeor from Google Play. Have fun, and don't forget to let us know what you think! You can submit feature requests here, or reach out to us directly at contact@aviary.com.